Tim Cook is Apple's most politically engaged CEO since John Sculley. 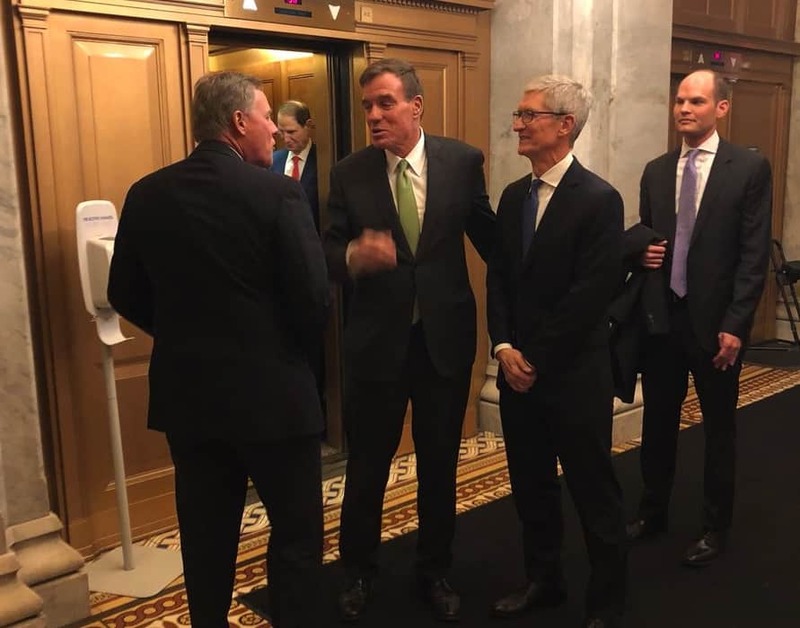 Tim Cook visited Washington D.C. on Tuesday, having lunch with Senator Mark Warner, vice chairman of the Senate Intelligence Committee, who has shown considerable interest in the subject of digital encryption and privacy. A photograph taken by NBC News producer Frank Thorp showed Cook on Capital Hill meeting with both Warner and Senator Richard Burr, chairman of the Senate Intelligence Committee, who is leading the chamber’s investigation into alleged Russian interference in the 2016 United States elections. Apple has kept quiet about what the meeting involved, although it seems that Tim Cook and the tech-savvy Warner have some shared interests when it comes to the subject of privacy. When Apple was engaged in its 2016 standoff with the FBI regarding the unlocking of the iPhone belonging to one of the San Bernardino shooters, Warner announced a bill that would create a congressional commission to address digital privacy issues. Tim Cook is no stranger to Washington D.C. He may be the most politically engaged Apple CEO since John Sculley in the early 1990s. Like John Sculley was once considered as a potential running mate for Bill Clinton, during the 2016 Presidential race Cook was reportedly considered on the short list for a possible running mate for Hillary Clinton. During that campaign, Cook teamed with the Hillary Victory Fund to host a fundraiser, with tickets costing anywhere up to $50,000. Apple’s lobbying spend has also more than doubled during Cook’s reign as Apple CEO, although it still lags behind other tech giants such as Google.